The ancient ruins of Jerash in Jordan make up one of the best-preserved Roman cities in the world. So why are they not better known and why are they not a World Heritage Site? When you think of visiting Jordan, you can probably quite clearly see mental images of the big sites – Petra and Wadi Rum, for instance. The rest of the country, though… well, perhaps it’s a little hazy. If you’re like me, you may know you want to go but you’re not exactly sure what else there is to see in Jordan? As it turns out, I am rather ashamed to say that there’s a huge amount and most of it I had never heard of before. For a constant traveller, my knowledge of this part of the world is embarrassingly poor. There is one place in particular that I can’t believe I had not heard of before – the Roman ruins of Jerash. I’m so glad that it was a part of my G Adventures tour and I was able to see it. 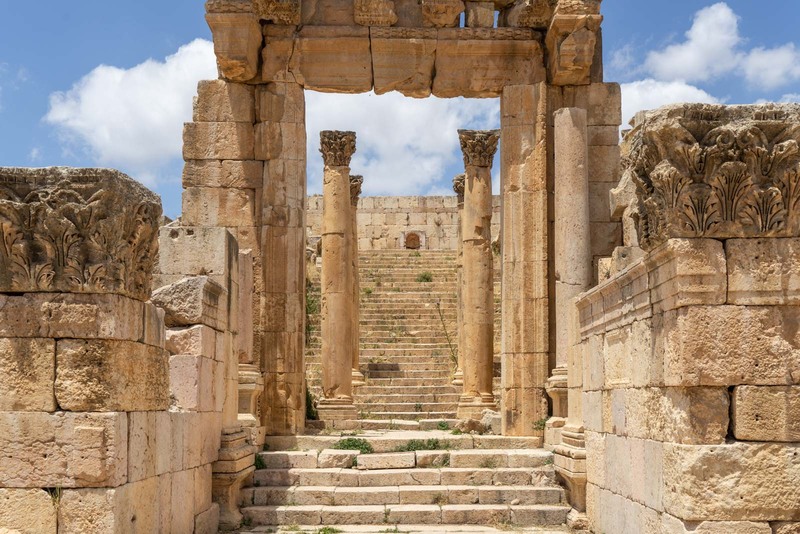 Today I want to tell you all about it – and why, if you’re going to Jordan, you have to visit Jerash! Jerash was actually founded as a Greek city by Alexander the Great in the 4th century BC. But it was under the Romans about 300 years later that it truly began to flourish. I have already written about visiting Petra, the iconic ancient city in the south of Jordan. To understand the history of Jerash, I think you need to view both of them side by side. Jerash and Petra existed at exactly the same time and were just 300 kilometres apart. And they were both in this economically-glorious position of being in the middle of overland trade routes connecting the continents. Jerash was the trading centre for the Romans, with goods coming in and out of their empire in Europe to the northwest. Petra operated as the trading centre for goods coming from Arabia, Asia and Africa. These two cities connected these two enormous spheres of trade, and they both were enriched by it. 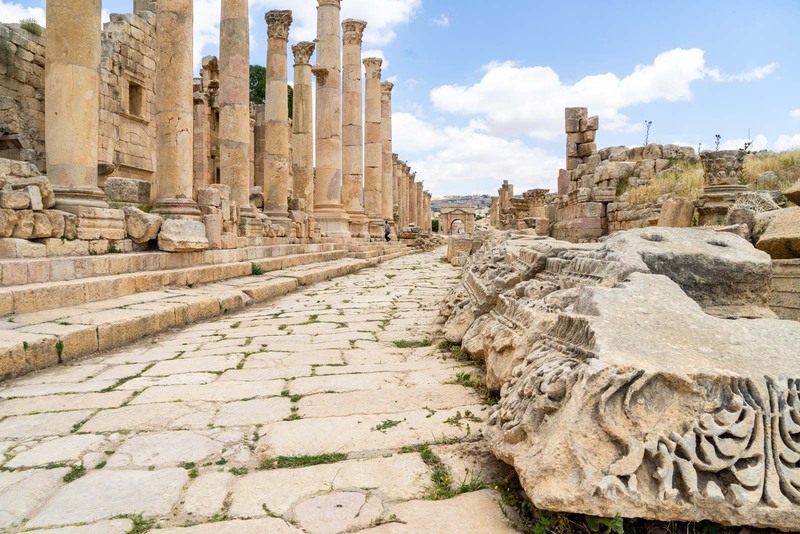 Jerash grew and grand buildings worthy of this wealthy city were built – theatres and temples, a hippodrome for chariot races, an enormous oval-shaped plaza surrounded by colonnades. It was one of the most impressive Roman cities to ever exist in the world. Of course, this was all helped by a decision in 106 AD by the Roman Emperor to bring the lands where Petra was under Roman rule. Imagine how much more you earn when you also control your major trading partner! These days, Jerash is described as being in ruins, but don’t let that fool you. It may not look the way it did two thousand years ago but it’s one of the best-preserved Roman cities that you will ever see in the world. I had no idea of the scale before I arrived and immediately I was stunned. You’ll come in through a large arch and then the site stretches out in front of you. I couldn’t see the end of it, just temples other buildings on hills in the distance. Measuring it as the crow flies, it’s about two kilometres from the entrance of Jerash to the furthest point on the other side. But, as you follow the paths and wander around to see all the different sites, it takes much longer to reach than you expect. I arrive with my G Adventures group and, of course, our guide knows the best route to take through the site. As he leads us around, he tells the story of Jerash and points out the most important parts. There are two theatres, one at the southern end and one at the northern end of the city. It might give you a sense of life here during the Roman times that they needed more than one theatre. There’s the impressive Oval Plaza with the colonnades, that’s 90 metres by 80 metres and dominates one side of the city. Stretching out from there is the Cardo, the main axis street that is 800 metres long and has columns all along its length. The Temple of Zeus at the southern end is one of the most impressive structures, partly because of its position on a hill, looking out over this part of Jerash. And, at the other end, the Temple of Artemis, also has a grand design and a prominent location. Amongst all of these are the ruins of other buildings, some pieces of art including floor mosaics, and the streets that connect them all. Our group spends about three hours here in the end, which is probably about the right length of time to see most of it and hear some explanations. You could easily spend longer, if you were really interested, though. 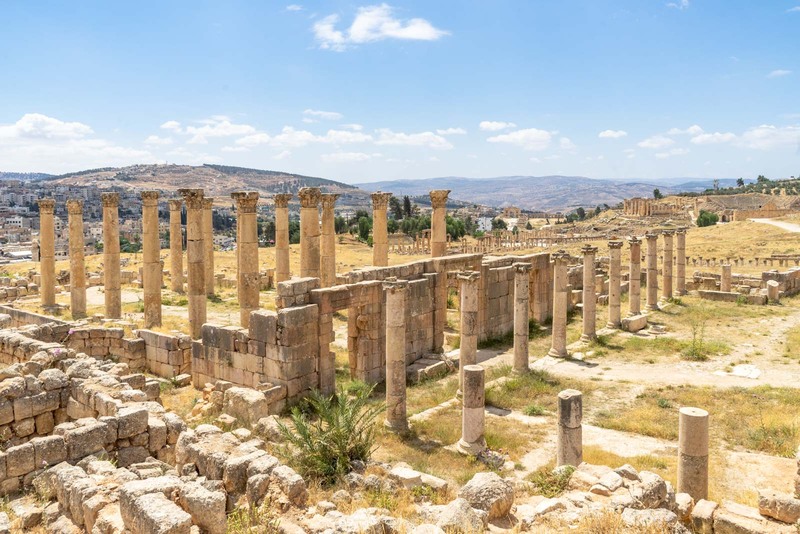 Is Jerash a World Heritage Site? 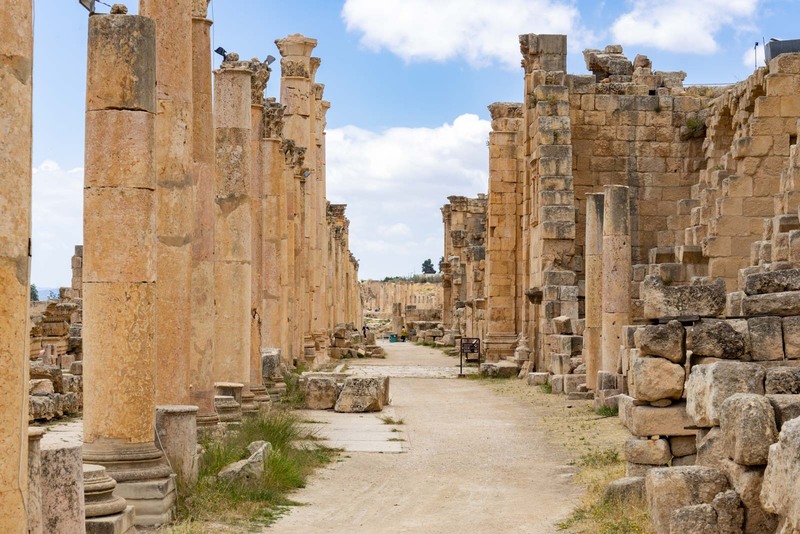 You may be wondering whether Jerash is a World Heritage Site. As you know, I try to visit as many as I can and this would seem like exactly the kind of place that should be added to World Heritage List. Well, it’s not – but that’s not from lack of trying. Jordan has actually asked for Jerash to be considered a few times. The first time it was officially submitted for consideration was in 1985. Back then, UNESCO said it was a good candidate but that Jordan needed a better management plan for the site and needed to address some issues about the way it was being restored (some of the techniques were not up to international standards). Jordan came back the next year, in 1986, with answers to some of these concerns but it still wasn’t enough to satisfy UNESCO. So the push to have it added to the World Heritage List was put on hold. The next attempt was in 1995 and by this stage most of the previous issues had been addressed – particularly the restoration techniques, which were now apparently much improved. However, there was a new problem with concerns that the annual Jerash Festival had constructed permanent facilities on the site. So it was put on hold again. In 2004, Jordan added Jerash to the ‘World Heritage Tentative List’ which is a new requirement for consideration since the last attempt. But, since then, there has been no official request to actually have it assessed again by UNESCO. So, who knows when it might actually happen. It seems a real shame that Jerash is not on the World Heritage List. By almost every main criteria, it is a worthy site. The reasons it hasn’t been added may be valid but they also seem quite minor in the grand scheme of things. They are technicalities, rather than a fundamental problem. I think it’s really disappointing that, 30 years after it was first considered, the issues have not been resolved. Let’s hope that there’s a bit of a push from everyone involved to get Jerash the heritage status that it deserves. It is a glorious testament to human history, a symbol of the wealth this region once had, and a wonderfully-preserved artefact of an empire. Plus, besides all that, it’s just a fantastic place to visit and another highlight of Jordan! WANT TO TRAVEL TO JORDAN? I travelled to Jordan with the support of G Adventures in my position as a G Wanderer. 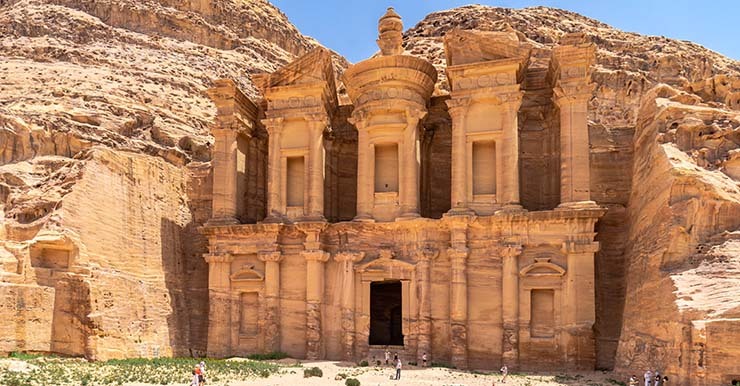 All the opinions expressed are my own – I truly believe G Adventures is one of the best tour companies that you can use for a trip to Jordan. You can find out more about the Highlights of Jordan tour. And you can also see the other G Adventures tours that go to Jordan. Should you do a group tour to Jordan? Such a wonderful place, even lots of places i seen on movie shoot. I would go once in life and want to enjoy like you. Images showing that you enjoyed your trip. Jerash is a pretty amazing place to visit. I always love the historical places and after reading your post I will definitely visit there. I am planning to Visit Jordan Next month. Beautiful pictures!! The ruins are beautiful. I don’t have much idea about this part of world either, all I know is probably just petra haha. I’ll read more from your blog about Jordan! What an amazing beauty Jordan is. Loved the pictures. Thanks for sharing. What an awesome Thoughts! It really great article and loved it. Your post are so motivating! Jordan has always fascinated me the most. Loved your blog. Cheers!